Who doesn’t want to make his job easy, simple and quick? Thanks to contemporary technologies, we can do any work without pain and hassle. Same goes with the painting tasks. With the help of great HVLP paint sprayer (High Volume Low Pressure), you can paint anything flawlessly and quickly. The HVLP paint sprayer gives you complete control over the painting. As a result, you get fine and detailed results. The HVLP paint sprayer not only saves paint consumption but also creates less mess and waste. These sprayers are great when it comes to preventing overspray. Besides all that, these sprayers are compact, portable and a great investment. So, be it a wall, door, car, or even a graffiti art, these spray paints are perfect for any type of object. Buying the HVLP paint sprayer that suits all your requirements is not that simple. You have to look at its all aspects including results, adjustability, sturdiness, and cost. Therefore, to save your time and money, we have reviewed the best HVLP sprayers in this article. Its a detailed and comprehensive buying guide for all the paint lovers. 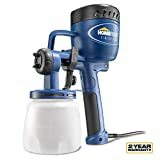 How to use an HVLP Sprayer? When it comes to getting the best HVLP paint sprayer at the cheapest price, we recommend you to pick HomeRight Finish Max. It weighs 3.4 pounds and measures only 6 x 11 x 13 inches. Due to which, the product is portable as you can use it for both indoor and outdoor jobs. To add the versatility to the paint, the spray is equipped with three spray patterns. So, you can get different outcomes using the same spray. Along with it, you can also control spray width from one to six inches using its adjustable spray knob. Its 0.08 inches wide brass tip adds consistency to patterns. Besides, the brass tip is corrosion and wear resistant. Thanks to its plastic body, you can keep spraying with it longer without even painting your hands. Further, the product is suitable for painting furniture, dressers, cabinets or anything you want to paint. In addition, the tight seal of spray maintains the air pressure, thus preventing the backflow of paint. On the whole, the user's response positively about the product. Most of them loved the simple design of the product. While others praised the finishing results of the spray. However, most of the users complained about the leakage of the material. The product is not ideal for heavy duty spraying. This product is the best pick for beginners and peoples who love DIYs. Hence, it is a great investment at the minimum cost. Whether you own a workshop, love automobiles, enjoy wood painting or just a contract painter, there is no better option for you other than Earlex Spray Station. The product is well-known for its extensive uses from spraying cars to spraying woods. The Earlex HV5500 comes with an air hose, power cord, spray gun, and a paint container. The 13 feet long hose and 5.5 feet power cord increases unit maneuverability. While the spray gun is equipped with a two mm stainless steel tip and a needle. When it comes to painting storage, you will find no best option other than Earlex HV5500. The product comes with a Teflon coated container that can hold up to paint. Due to its quick release lever, you can load the material without any difficulty. Using its turbine, the sprays with 42 CFM and 2.2 PSI force. Plus, you can also change the up to three spray pattern using its Push N Click feature. Hence, it lets control spray volume and width from one to 12 inch. In addition, the pick-up tubes of the product are designed in an angular way. No matter if you want to spray with a certain angle or straight at the object, the versatile pick-up tubes let you set the spray angle. Above all, the Earlex HV5500 offers durability, control over flow and mobility. The unit comes with a carry handle that lets you carry the product anywhere you want. Because of its features, the product is best for indoor and outdoor use. Most of the users complained that they had to buy different sized needles separately. Other than that, the spray is ideal for on-field painting and leaves a finishing look on the object. The Earlex HV5500 is an ideal choice for those who like to paint automotive and want finer and detailed paint results. 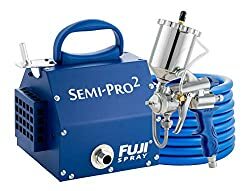 Although the Fuji Semi-Pro 2 looks a bit odd, it is the high rated HVLP paint sprayer nowadays. With its adjustable pattern control feature, you can paint using any weight. Hence, this flexibility helps you complete a variety of projects. Its ergonomic handle helps you grip it firmly and doesn't even strain your hand. 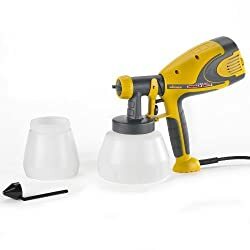 Plus you can also convert the spray gun into a bottom feed cup and a gravity feed cup. Thus, the convertible spray feature makes the product unique and result oriented. Another advantage of the Fuji Semi-Pro 2 is that it sprays in a tidy way, leaving no mess. Also, the product prevents over-spraying of the material that saves your paint. Due to its metal spray, it is sturdy and strong. In fact, the turbine is also made up of metal. Check also our review about the Best paint sprayer for metal surface . The product is durable and reliable. Equipped with the carry handle and wheels, the spray is portable and easy to carry. The 25 feet long hose with its air control feature prevents the backflow of paint. In addition to this, the product comes with air caps of multiple sizes which help in spraying materials of the different thickness level. The stainless steel needle reduces the chances of wear on its tip. To conclude, the product is best for spraying the water-added and solvent-based materials. Even the non-professionals loved to use Fuji Semi-Pro 2. However, the capacity of the gravity cup should be upgraded to at least one quart. The product is comparatively heavier. This one makes a good option for professionals and non-professionals. In fact, Fuji Semi-Pro 2 is one of the reliable investment when it comes to money, energy and time. If you are hesitating while buying a new HVLP sprayer, you should try using Wagner 0518050. While costing only a hundred dollars, the spray gives you full command over results. Be it horizontal, vertical or circular - you can paint the pattern of your choice using this product. You can choose the thickness from one to ten inches. The two-stage air turbine creates a smooth, even and fine result. Whereas, the two material cups are changeable according to the use. For large and exterior works, you can use one and a half quart cup. While the one-quart cup is ideal for interior works. With its Lock-n-Go feature, you can quickly switch the material. Hence, it is ideal for quick and small to medium jobs. Plus, the multi-stage motor keeps off the flammable fumes from burning. The turbine sprays up to 4.9 fluid ounces per minute. Be it a stain, sealer, varnish or lacquer, Wagner 0518050 is suitable for applying thin materials. Weighing only four lbs, the product is one of the lightweight sprays from the list. With its quick and convenient features, the spray is a good pick when it comes to smaller projects. Most of the users loved its ease of functions and a rapid, clean spray. However, the paints require additional dilution for better results. If you are painting something in your kitchen, or it's your old office desk, Wagner 0518050 is ideal for everything like kitchen cabinet , smaller and finer jobs. Thinking about a decent looking HVLP sprayer? For that, there isn’t any better option other than Wagner Flexio. The product comes with X-boost turbine, split gun, two nozzles, and an 11.5 feet hose. The built-in storage compartment provides a storage solution for hose and nozzle. Hence, the storage compartment makes the product portable as it saves space. Working 12 times faster than a paintbrush, the spray is efficient and cost-effective. Its two nozzles provide spraying option while working on bigger or smaller surfaces. You can even spray thick and materials using Wagner Flexio. Its on-handle adjustment features give you full control overspray. Thus the feature prevents overspray and increases coverage. Also, its removable parts let you clean the spray easily. Thanks to the super spraying abilities of Wagner Flexio, you can stain-spray an eight by ten feet surface in a minute. Whereas, it takes only five minutes for the same surface while spraying with latex. Despite its plastic body, the product is reliable and sturdy enough. Be it a wall, fence, cabinet or anything in your house, Wagner Flexio gets your job done super quickly and easily. Lastly, because of its minimal cost, the product doesn't even strain your wallet. 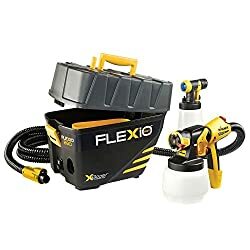 Even though the hose seems to disconnects often, most of the consumers like Flexio’s portable design and storage features. Whereas, most of the users also praised its quick spraying speed. The product is easy to understand and use, due to the user manual. It is suitable for all level peoples from beginners to professionals. Its lightweight gun helps to paint above the head level in a breeze. The product comes with one year warranty. Most often, the product oversprays. The nozzle keeps to clog hence it requires regular wiping. The Wanger Flexio is ideal when it comes to quick and well-defined results. Overall, it is a great tool for spraying households like windows, garden-fence, doors, walls, etc. With the increasing number of HVLP sprayers available in the market, it is becoming difficult for you to choose the right one. For that reason, it is crucial to get all the noteworthy information regarding the HVLP sprayers. On that account, we have listed down all the basic information about the HVLP sprayers. Other than the basics, this article will tell you everything you need to know about the HVLP. We are sure that this buying guide will help you find the right HVLP sprayer. Why Should You Choose an HVLP Sprayer? Right before getting the right HVLP sprayer, it is important to know “why you should choose an HVLP sprayer”? With the different spraying options available in the market, it is necessary to know “what makes you choose the HVLP sprayer over anything else”?. To answer this question, we have jotted down a few pros and cons of HVLP sprayers. Here are some key benefits of using an HLVP sprayer. With HVLP sprayer’s adjustable nozzles and spray gun, you can have full command over the paint. Thus, the sprayer prevents chances of overspray. Remember your old roller or paintbrush that used to soak a lot of paint? However, the HVLP works really well when it comes to material consumption. Its spray gun uses a minimum amount of material. Hence, it consumes less amount of material. With its effective technology, the HVLP sprayers leave fewer fumes and spray in the air. Thus it is completely safe for health and the environment. The HVLP sprayers are known for their fine and finished looks. Hence, it always gives the even super smooth coats to the surface. Because of spray guns, hoses, turbines, and carry handles, these HVLP sprayers are easy to take anywhere. Giving you full control over the material, these HVLP sprayers are ideal for smaller tasks. You get precise results by using HVLP sprayers. Finally, the HVLP sprayers reduce the overall cost of material as they use minimum material. Moreover, these sprayers are available at an affordable cost in the market. Not everything is 100% perfect in this world, so is the case with HVLP sprayers. Here is a limitation. Sometimes, the low pressure inside the hose makes the spraying process really hectic. This is why the HVLP sprayers are ideal for smaller projects and surfaces. While comparing other brands, look for the spray patterns of each of the HVLP brand. To be precise, the tight pattern creates flawless and nicer results. A tighter pattern reduces overspray and adds professionalism to our work. A good HVLP sprayer should spray smoothly even with the thick and undiluted material. By thinning the paint, you not only waste your time, but also it creates an untidy effect on the surface. Therefore, we suggest you look for a robust turbine, quality needles, and tips while buying the HVLP sprayer. While looking for low-cost HPVL sprayers, you might experience the plastic tips and nozzles. Of course, the plastic nozzles produce tighter spray patterns. However, the brass nozzles are wear resistant, removable and easy to clean. Most of the high-end HVLP sprayers come with a brass tip and nozzles. One of the major advantages of HVLP sprayers is its control over the result. Everyone loves to add a touch of professionalism in his work. One last thing that you need to look for while buying the HVLP sprayer, is the built-in storage feature. Most of the HVLP sprayers offer hose and spray storage in the turbine base. Although it has nothing to do with the spray results, we consider it as a plus point as it makes the unit portable. First of all, ventilate the area you are going to work in as we don’t want you to inhale paint fumes. To avoid the clogging while spray, clean the filters properly. Move all the things away from the painting room, that you don’t want to spray. Check and clean the air hose to prevent any snagging. Connect the air hose to the unit. To get the better results, we suggest you thin the paint prior to the process. Make sure the air nozzle you are using is suitable for the paint you are applying. Then, fix the air hose and gun together and regulate air pressure. If you want to do it quickly, adjust higher air pressure, otherwise, slow down the pressure for detailed work. Depending, you want a thick or think coat, you can adjust its fluid control to spray the desired amount of paint. Now to adjust the pattern, you need to regulate the air cap. By adjusting the pattern, you can get either a horizontal, circular or vertical stroke. Start to spray in a consistent way to get precise results. Lastly, after completing the project, clean all the parts of HVLP sprayer thoroughly. Regular cleaning makes the unit durable, stain-free and you can get ready for the next spraying session. To be honest, you will get a variety of products other than HVLP sprayers, that go well with your needs. However, you will hardly find anything as promising as an HVLP sprayer. The HVLP sprayers are getting even better day-by-day. Available under a minimal cost, the HVLP sprayers are becoming famous nowadays. Using this buyer’s guide you can even compare other available options with the HVLP sprayers. Keeping all the facts in mind, we are sure that you will choose the right HVLP sprayer for your project.